We realize that people with cardiovascular disease need education to manage the illness, so we incorporate specific tools that address the unique challenges for hypertension, angina, myocardial infarction, and congestive heart failure (CHF). Too often cardiac episodes mean repeat emergency hospital visits for people with heart ailments. The VNA teaches our cardiac patients lifestyle changes and encourages physical rehabilitation which helps them better manage their disease and prevent hospitalization. Making time to teach behavioral modifications and encouraging physical rehabilitation can help patients better manage their disease and prevent rehospitalization. VNA professionals are trained to care for patients with a variety of medical needs, including CHF and chronic obstructive pulmonary disorder (COPD). Our cardiac home health services can help reduce visits to the physician office and Emergency Room; improve your overall health by controlling risk factors; and supply peace of mind to you and your family members. 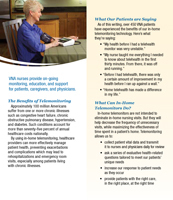 By using in-home telemonitoring, healthcare the VNA can more effectively manage patient health, preventing exacerbations and complications which may lead to rehospitalizations and emergency room visits, especially among patients living with chronic illnesses. Summary: Telehealth Technology is Part of the VNA’s Chronic Illness Management Program. 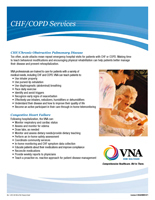 Summary: VNA professionals are trained to care for patients with a variety of medical needs, including CHF and COPD.